Roll out the puff pastry into a 1/8th of an inch thick on a floured surface and then use a 2 inch cookie cutter (square or round) and cut out 24 pieces. Fit the pastries in a mini muffin pan and press down the bottom to hold its shape. To make the egg wash, mix everything in a small bowl and brush over the pastries. Prick the pastry bottoms with a fork and bake right away for 10-15 minutes until puffy and golden. Remove the pastries from the oven and let it cool for 5 minutes. 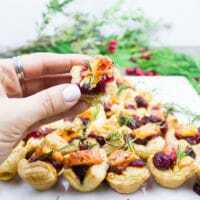 Arrange the pastry shells on a platter in a festive shape and then dollop the cranberry sauce ( a teaspoon or so—to taste) over each pastry. Add a chunk of the Kaukauna® Cheese over the sauce and finish off with some fresh rosemary. Make sure your pastry is cold before baking, and likewise make sure your oven is really hot before baking the pastries. This ensures a crispy, flakey and airy pastry base. You can bake the pastries in advance and freeze them for 2 months, then heat in a preheated 350F oven. The assembled appetizer can be served hot or served as a cold appetizer, made the same day.